Last week I shared a few thoughts on truescale. This week, I'd like to look at one of the options out there and share some of my thoughts on the model and building process. The model comes from Three Stage Studios. It's their True Scale Space Crusader Heavy Armour. SPECIAL NOTE: It has been brought to my attention that a considerable number of people have had varying issues with this product and company. As with all companies, please do your research before ordering anything from anyone in order to protect yourself. I know there are other companies out there just starting to get into this kind of thing as well and I'd love to hear about them if you know of one. I chose this company because it's the one I found and they were willing to work with me on getting a hold of a model to test out. I opted to paint him up as a Brazen Claw since I've never painted one of those before and always liked how the red and blue matched up against each other. I did mount him on a 50mm base if you're wondering. I found a 40mm base to bit a bit small looking and awkward in the end. The 50mm base just felt like it fit the model better. My personal opinion is that they are huge. Much bigger than I thought they would be. I guess I don't know how big things would be in truescale. Compared to regular guys, these almost start to look like Primarch type bits. But after looking around, I think they're on track for their size. Most folks figure the average Marine to be about 8 to maybe 10 feet tall (or 8 heads with the torso making up 2.5 - 3 plus one for the head for a total of 3.5 - 4 for torso and hips). Add 4 more for the legs and you get the 8 total. GW termies are only 5 heads tall which is why some folks complain. Doing them truescale really does increase their size and the bulk of the armour. I think the GW arms work on the bits as they make the arms the correct length ending with the hands at the pelvis when hanging straight down. If anything, I think the torso is a shade too wide, but that's my personal taste. 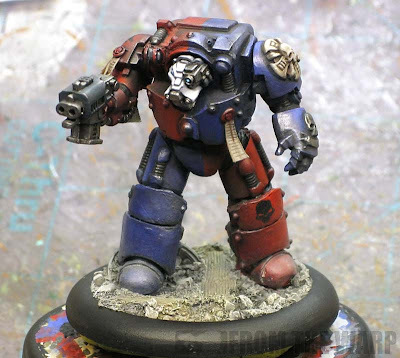 I wonder sometimes when I look at the model if the GW terminator arms and head are a bit too small for this armour. I go back and forth on that last point about GW bits "fitting" on these at the correct size. It might be the shoulderpads that throw me off. I wish they were slightly bulkier to match the bulk of the rest of the armour. The arms are the correct length for me the more I look at them, it's just the shoulderpads and the bulk of the powerfist that seem lacking. Trying to upscale those could be a huge problem so I'm not sure how to remedy that one. The bits are good overall, but need a little more work. The poses could always be more dynamic. That will always be the case and I'm sure that creates a tremendous amount of work for the company so there is a balance there when it comes to what can be done and offered to us consumers. I like that the legs are split in two pieces with these models as that allows someone like me to reposition them as needed if I wanted to. The feet and legs do not stand correctly for someone in a standing position as the pelvis is situated just a bit too far back. The center of gravity is off and the feet need to be under the pelvis unless you are trying to show movement like running. The guy would fall over backwards if he tried to stand like this. It's a minor point, but very important. Not everyone will notice it, but some might look at the model and it just won't "look right" to them. They may not be able to explain center of gravity and where a pelvis should be for stability when a human stands upright, but they will recognize something is not quite right. The huge plugs of resin from the casting are a bother, but not too bad as they are in places that can be hidden or easily covered up. There are worse places to have them and a pair of hobby snips makes short work of them. The mold lines don't look too bad either. Things like mold lines can be hit and miss depending on the batch and I think folks understand that when working with resin stuff. The mold lines on these models are similar to what you'd find on other cast items out there. 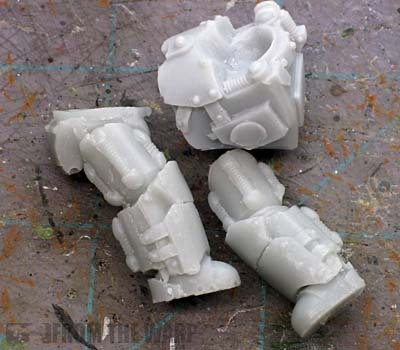 In this case, they run down the sides of the legs like normal terminators do. This brings it over some detail on the sides of the legs that can be a bit of a paint to clean, but there are only so many places you can place mold lines for production I'm sure. It's a trade off in the end. I had no problem plugging in a terminator helmet and attaching terminator arms to the sides of the model. I went a touch above and beyond and altered the pose slightly by adjusting his arm position. That and his leg got a little bit of greenstuff flex fitting added so I could practice altering the pose and working with the bits. Their larger size made it quite easy to pin the pieces (like the legs and the feet to the base). The detail is good great. Pre-Heresy stuff is always thought of as being a bit more simple in it's design and construction and I think they've gone far beyond that here with the layered look to the armour plates and the rivets. Lots of times, companies will use that "plain" excuse as a reason not to add any surface detail to a model. That's not the case here. You have lots of details and still have some nice areas to add freehand to. All in all, I'd say these guys are a win, but will need some work. Mainly because it brings the realm of truescale down to someone who would otherwise never have models like this due to the sheer amount of work involved. Someone with no experience can order these and the associated bits they need (heads and arms) and create a great looking stylized force with some work. Someone like me (with a little experience) can take them and build on them, make adjustments and fine tune them (while saving myself considerable work with custom sculpting) and create a great looking force just the same. Truescaling gives a completely different look to an army. It's going to take time and money to pull something like this off. While being able to buy the "correct" sized bits is a big part of getting there and not having to sculpt each one of your figures, they are only the first step and certainly not a magic bullet for the whole process. Next we look at a few size comparisons to give you an idea of how scaling up your troops will affect everything else in your army. Surprised you've been able to get ahold of some of those bits, apparently people have been having trouble lately. I'm just thinking if the shops providing these truescale bits are actually going about it the wrong way. Instead of sculpt larger bodies for the large heads, wouldn't it be simpler to sculpt smaller heads to the smaller bodies? If only the head truly is the problem area in the scale, I'd go about fixing the head, not making a bigger sculpt to work as a "fix around" for the problem. It should be noted they are sold out. Will you be looking at Tartaros Pattern Terminators from Forge World? I know that you're not that taken with them, but they might qualify as True Scale as they are taller and more upright, at least to my mind. I like them, and I think they'll look quite good in Crimson Fist colours. However, as MasterSlowPoke has mentioned, the business practices of the guy are unprofessional at best and at worst outright scamming. When I saw the name I went to have a look at a potential new shop to buy from and found lots and lots and LOTS of unhappy mentions of the name. Hell, the guy's even cast Lego bits for a Titan (The original Bionicle Tahu mask for the head. It's not on sale any more, but still). Not just you, Plissken. I was thinking the same thing. I think that, if you were to slap this guy over the Vitruvian Man, it'd look pretty grim. The head's attached to the battle-brother's collar bone. Bigger shoulder pads would help it overall, but the location of the head's just pretty troubling. MasterSlowPoke: You're not the first one to mention the issues. Apparently this is a problem I was unaware of initially. Icchan: You bring up a very good point. A simple head fix in terms of size across the board with all your models that have bare heads and it might make a super easy fix. Anonymous: I did not know that. Well, this post may serve more as a study of the idea of truescaling with it's more common issues than a review. G_Man_007: I'd like to. Anyone want to send me a model or two to paint up? Sam: Thanks. The business issues and the Lego head issue are something I have not touched on in this post. I have tried to keep my comments product related as far as "truescaling." Plissken: That is an issue I have as well. 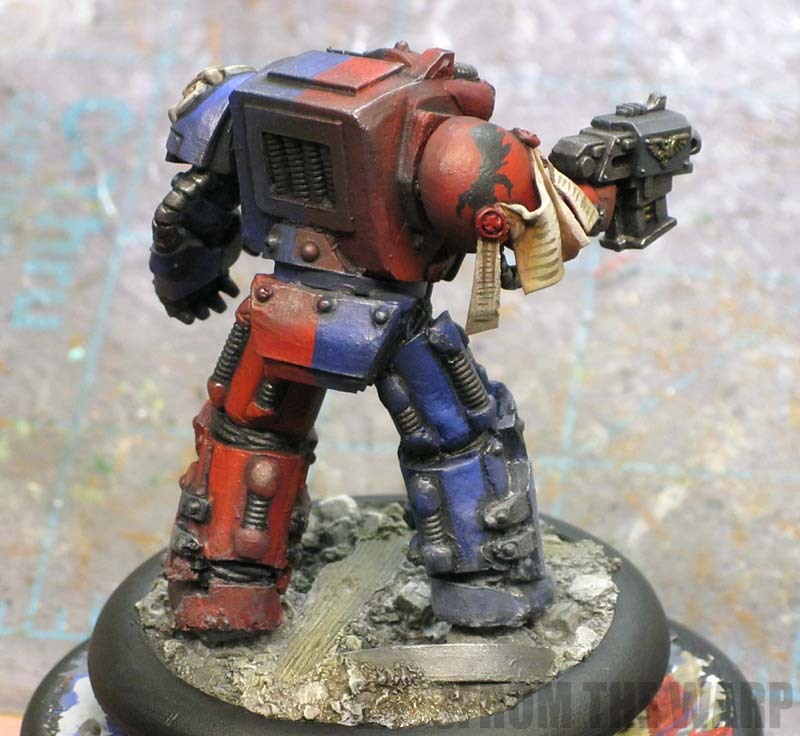 Rushputin: That's another issue I have with Terminator models. Their arms are attached way to high. Well, I thought your graphic in the other post successfully demonstrated that yes, they're too high but they're not a lot too high. I'm willing to make concessions when were talking about a genetically modifier post-human 38 millennia from now. But this kit takes that too-high arms problem and turns it to 11. I might be prepared to make allowances with the regular kit's slight deviation... but what's going on here is too much for me. I think Rushputin has it. It's almost as if the shoulder joints are coming out of the top of his head. I couldn't reconcile the scale of the arms but now I realise it's that they are too high. Indeed if the shoulder pad was bigger it might explain why they are so high up but because it's slim in comparrison to the rest of the model there's no hiding where the pad joins the torso. You want to see how one of your Pre-Heresy shoulder pads would look on top of everything. Just a quick mock up might resolve a lot of the issues. Well Ron, I applaud your efforts and thank yu for doing the review for all of us out here in Internet land. I can't agree at all on the assessment of the kit, unfortunately. It just looks...soft. More of a Michelin Man than a walking tank. I've never, ever been a fan of truescaling, as so few people manage to pull it off convincingly. The trend seems to be either to alter existing GW bitz to make them wider/taller or to sculpt entirely new models. The former only exaggerates the scale problems when it comes to heads and gear, and the former is rarely, if ever, done with any precision. There are so many doughy truescale Marines out there! I'd also echo MasterSlowPoke's "buyer beware" warning. TSS has had some very bad press following it for quite some time. Hmm, not trolling but that model realy looks terrible. Your paintjob is great of course. The detail is limited to rivets and cables. The GW bits do not match well with the body. The model is too bulky. The chest too wide, the legs too wide and spaced apart. There is something wrong with the crotch and behind areas... Overall the effect is not true scale. Sorry TSS, this needs to be entirely resculpted IMO. Start over. The exaggerated proportions of this model highlight a long-standing issue I've had with Terminators. It's not the shoulders being too high, it's the placement of the head. Placed on the front of the torso between the shoulders, the head gives the appearance of the occupant hunching forward inside the armour, not standing straight. However, the placement of the shoulders are too far back to match this posture, being in line vertically with the hips as if the occupant really is standing upright. Has anyone else thought about this? All the 'true-scale' and proportional debates I've seen are viewed from the front, with narry a mention of lateral proportion or posture. It's also bugged me that Terminator helmets aren't really sized to put a head inside, but that's another issue. The Bear: I agree on the posture. I made some slight changes to a regualr terminator in terms of setting the head on top of the shoulders as opposed to in front of and the difference is substantial. It makes the model appear to stand upright instead of hunched over like you mentioned. You're right, he needs bigger arms. I completely agree with you Rushputin, the anatomy of the model is way off, he looks a little like WHF Ogre. The armour looks good, and captures the Heresy era feel, but the scale and anatomy are too off without a lot of work done to them. What a great article once again. I Personely don't like the model at alll. It looks out of proportion with such a small head and such tiny shoulder pads or arms. Weaponery is way to tiny as well. If you look at GW models it kinda is in proportion or totally impressive big. This stormbolter should be scary, now it looks like a childs toy compared with such a large piece of metal behind it. The painting of the model itself is once again great. Thanks for the review on the bitz! Without larger shoulders and weapons, I think this is one to pass on. Although, I don't really get the whole true/art scale thing - if they just made smaller IG, who would know Space Marines are undersized? he looks like a contemptor dread with man arms and head. Hmmm, Feeling the proportions are a bit wrong, his shoulders are almost 4 head widths apart. Also can you put him next to a guardsman for reference? chet manly: You're right, he does some amazing work. 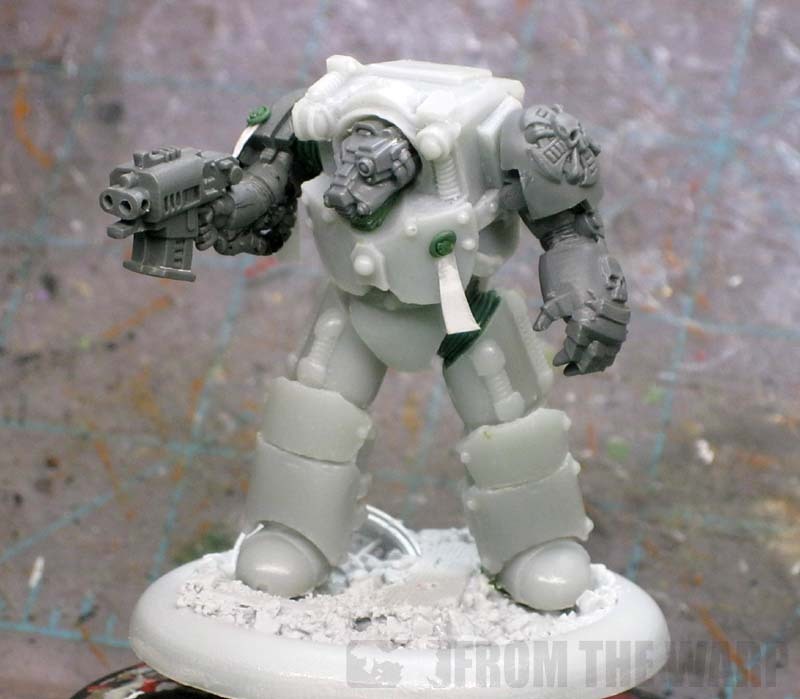 Mohaniker: Truescaling a power armour marine seems quite simple. A few termie parts (mainly the legs) to size-up things and you're all set. It's the termie that I see the challenge in. D.W.G. Wals: The scale of all kinds of things starts to come into play once you go down the truescale road. Weapons are one of them. Good point. Matt: Good point. make the humans more human sized and the Marines suddenly get bigger. MrHGHowell: Wait until you see him next to a dreadnought. The size comparisons will be next week to show the additional issues that come up with truescaling your troops. TheTrans: Yes, next week I'll have lots of comparisons in terms of sizes to other models and vehicles. I checked out your links and i was blown away by these amazing models. But are they really true scale or just bigger marines with another size / scale ratio?!? I gotta say, that is probably the funniest-looking terminator I've ever seen. I checked the link. Truely amazing good looking. A lot of work to get this kinda result though. I would get addicted to true scale i'm afraid so i'm not going to walk that road just yet. Thanks for the feedback. Ron, you responded with this: "You're not the first one to mention the issues. Apparently this is a problem I was unaware of initially." To MasterSlowPoke, who posted the very same link that I emailed you on August 9th. In reply to me, you told me you had a review planned. Was this review not posted at that time? Did you go ahead and post it after I warned you? RITides: I appreciate the email you sent me about this as well. The purpose of my review was to share my personal experience with the product and how I feel about it's ability to capture the truescale effect. I am not able to speak with any authority concerning others experiences in relation to this particular company or any other company out there for that matter. I do not condone "ripping people off" or any business practice that hurts consumers, but I will not discount every company out there simply because someone else is unhappy with them or reports a problem. In that case, there would be no companies out there to work with... including Games Workshop. Unfortunately, there are some companies out there that prey on consumers. There are some companies that have small issues that are resolved quickly and sometimes it's the consumer that will never be happy. Sometimes it's a combination of more than one of those. As we have discussed before, there is no way for anyone like myself to verify either side of an argument like this. I do not have the time or resources to undertake a project of that scope. I believe that everyone who purchases a product (especially online) MUST do their research beforehand. I have found companies that make great things that I would love to have, but have decided not to buy them after reading reviews. Buyers need to educate themselves and then make their purchasing decisions based on what they are comfortable with. I would hope that someone who saw this post and looked at the review also looked through the comments and found the additional information provided. They should follow up on all sources both good and bad about a company they are going to buy from before they make any purchases. What I post here on FTW is not gospel and should be taken as so. It is the opinion of one hobbyist (myself) and should be looked at as such. Even with the simple things like basic tutorials... they are just my opinion. I'd love to hear back from you, and email might be better for this given the length of our previous discussions.